Antonino Gandolfo (1841–1910), The Last Coin (c 1880-85), oil on canvas, 85 x 65 cm, location not known. Image by Luigi Gandolfo, via Wikimedia Commons. Last week, I looked at some surviving narrative paintings by the Sicilian artist Giuseppe Sciuti (1834–1911). His last teacher, before he had to work as a decorative painter, was Antonino Gandolfo (1841–1910), who I described as “a notable social realist and portrait painter” in the city of Catania at the time. When I took a look at Gandolfo’s work, I was amazed to see a similar Naturalism which was all the rage in Paris at the time, thanks to the popularity of Jules Bastien-Lepage. An Italian Naturalist? So here is the evidence. Several of these images are small, some are monochrome versions of paintings in full colour, but I hope that you find his paintings as moving and fascinating as I do. Gandolfo was born into an artistic family in Catania, and apart from a year or so studying in Florence – which Sciuti visited much later – he trained and worked in his home city on the Italian island of Sicily. 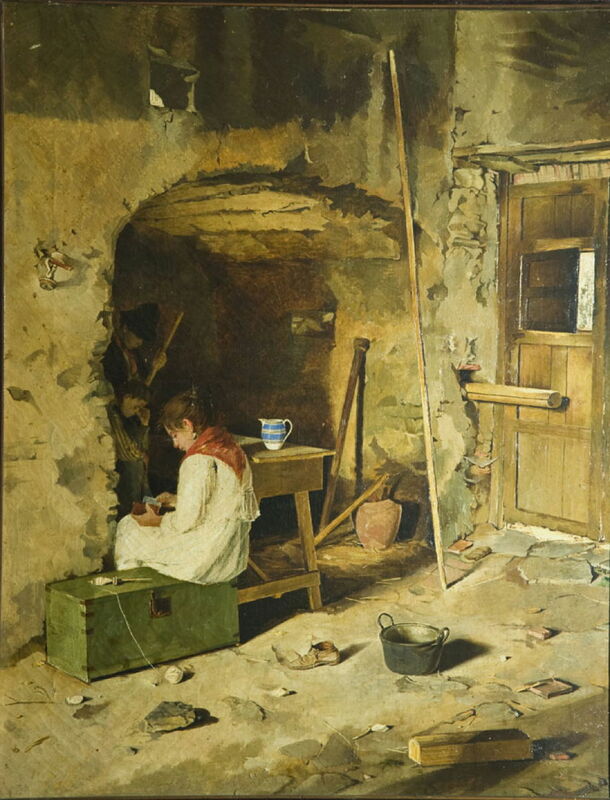 He was in Florence in 1860-61, and worked in the studio of Stefano Ussi, a rather conservative academicist who seems not to have noticed the changes being wrought by the Macchiaioli. Gandolfo started making exhibitable works in 1861, and one painting, now lost, impressed King Vittorio Emanuele II. But instead of pursuing a career in the north, he returned to Catania, where he seems to have set up his studio. Antonino Gandolfo (1841–1910), Temptation (before 1880), oil on canvas, 62 x 90 cm, location not known. Image by Luigi Gandolfo, via Wikimedia Commons. Temptation seems to be his earliest surviving painting, and was completed before 1880. It bears all the hallmarks of Naturalism: carefully detailed realism in its figures, and a strong social message. The young woman clutching her head has just succumbed to an offer of money from the young man behind her, who is holding his wallet out ready to pay her for services. Her mother sits on the other side of a ramshackle wooden table, looking away in despondent disinterest. 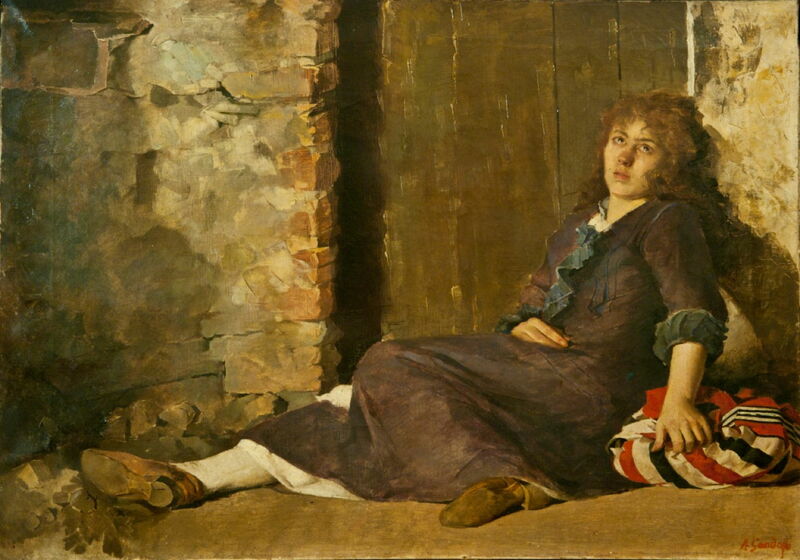 The young woman was modelled by Maria Grancagnolo, who lived at Gandolfo’s house after his first wife committed suicide in 1874, became his favourite model, and in 1891 his second wife. The man is her brother, and the older woman their mother. It shouldn’t be surprising that Gandolfo became a Naturalist at this time. His family was also literary, and he moved in literary circles. He was good friends with Sicilian writers who were ‘Verists’, including Luigi Capuana (1839-1915), who was one of the first Italian writers to be influenced by Émile Zola. Antonino Gandolfo (1841–1910), Evicted (Let he who is without sin cast the first stone) (1880), oil on canvas, 88 x 63 cm, location not known. Image by Luigi Gandolfo, via Wikimedia Commons. Gandolfo’s most prolific period of Naturalist painting appears to have been between 1880 and 1885, which coincided with its height at the Salon in Paris, and Bastien-Lepage’s death in 1884. Evicted, which bears the Biblical sub-title of Let he who is without sin cast the first stone, dates from 1880, and shows a woman cast out into the street, her only possessions in the bag under her left hand. Antonino Gandolfo (1841–1910), The Usurer (1880), oil on canvas, 100 x 82 cm, location not known. Image by Luigi Gandolfo, via Wikimedia Commons. The Usurer, also from 1880, signals a very unhealthy relationship between two women. 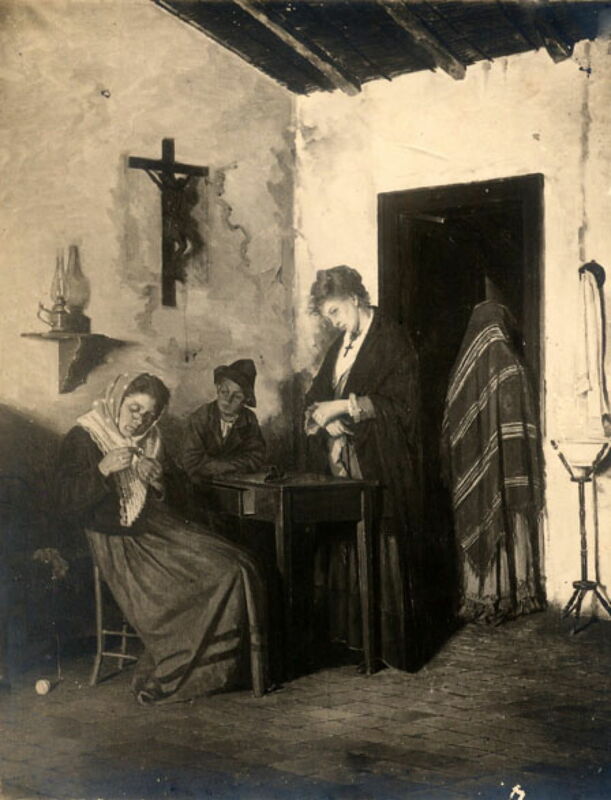 The older woman, seated, appears to be counting out money, which the younger woman, standing, wants to raise, perhaps for the purchase of the clothes seen in the doorway. All this takes place under the prominent crucifix on the wall. Antonino Gandolfo (1841–1910), Forced Music (1880-85), oil on canvas, 140 x 80 cm, location not known. Image by Luigi Gandolfo, via Wikimedia Commons. 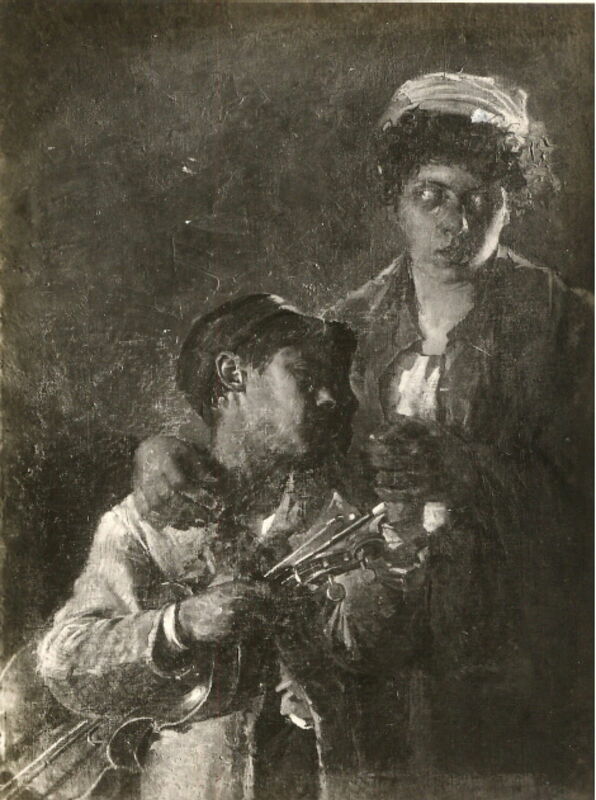 In his Forced Music (1880-85), a blind mother leads her daughter and son out onto the street, where they perform in the hope of reward. Gandolfo pays careful attention to detail in their clothing. Antonino Gandolfo (1841–1910), Compensation (1880-85), oil on canvas, 84 x 51 cm, location not known. Image by Luigi Gandolfo, via Wikimedia Commons. 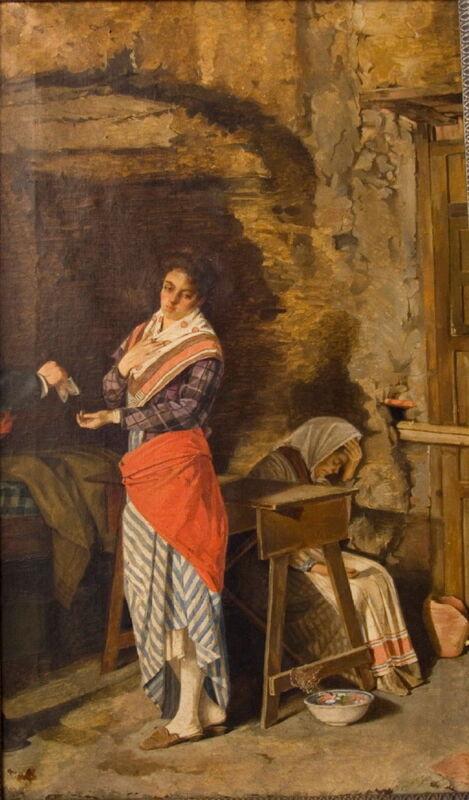 Compensation (1880-85) returns to the same theme of prostitution in Temptation, but the man settling his bill is only seen by the hand holding out money, and a foot. The young woman holding out her hand to receive, looks away in shame, and wears scarlet to advertise her trade. We stay in the poor quarter of Catania for The Last Coin (c 1880-85). A young woman, who has been spinning, sits on an old chest and takes the last money from her purse, presumably to pay for some milk to fill the blue and white jug. 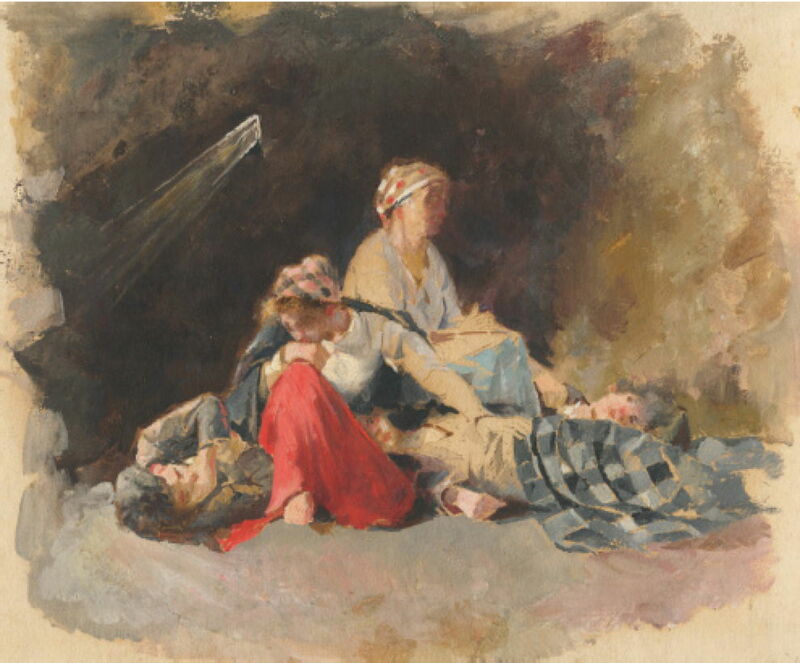 Antonino Gandolfo (1841–1910), The Proletarians (sketch) (c 1880-85), oil on canvas, 29 x 22 cm, location not known. Image by Luigi Gandolfo, via Wikimedia Commons. 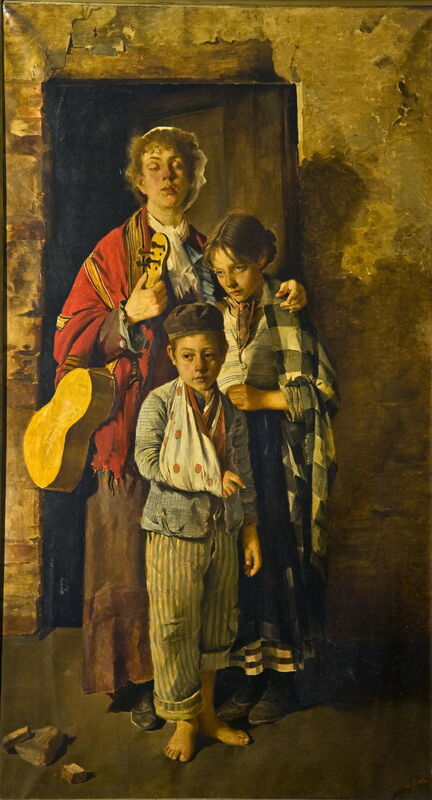 The Proletarians is an oil sketch of a family group made in about 1880-85 in similarly squalid conditions. 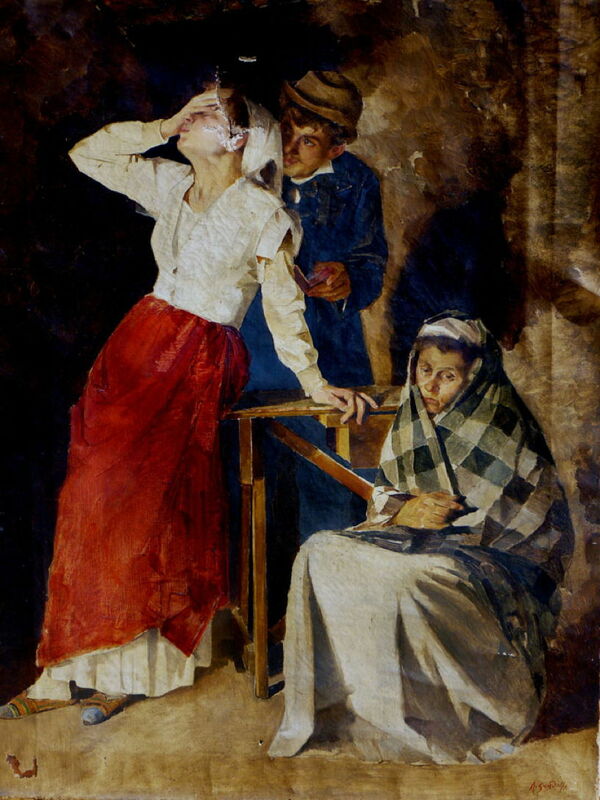 Antonino Gandolfo (1841–1910), The Blind (c 1885), oil on canvas, 91 x 69 cm, location not known. Image by Luigi Gandolfo, via Wikimedia Commons. The Blind, from about 1885, revisits the theme of blind beggar-musicians from Forced Music above. Antonino Gandolfo (1841–1910), By the Way (c 1885), oil on canvas, 75 x 60 cm, location not known. Image by Luigi Gandolfo, via Wikimedia Commons. 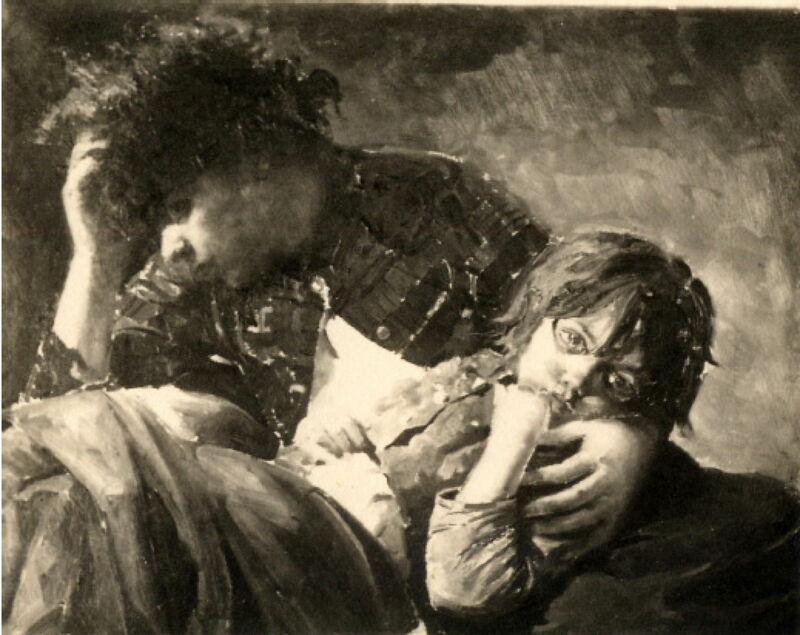 By the Way from the same period shows a mother and daughter sleeping rough by the wayside. As far as I can see, Gandolfo’s Naturalist works petered out in the late 1880s. He was also a very successful portrait painter, and painted some local scenes and views too. 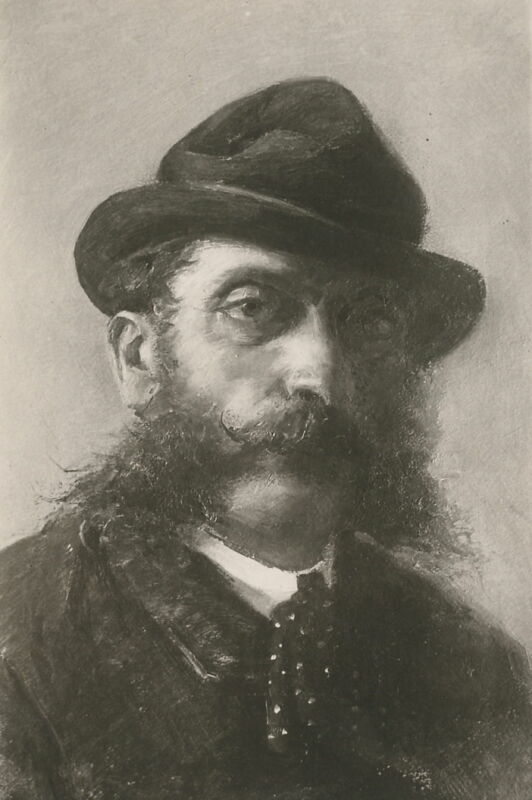 Antonino Gandolfo (1841–1910), Self-portrait (c 1890), further details not known. Image by Luigi Gandolfo, via Wikimedia Commons. Gandolfo painted this Self-portrait in about 1890, when he must have been almost fifty. His ‘pupil’ Giuseppe Sciuti remained a good friend, and was actually a few years older than his ‘teacher’. 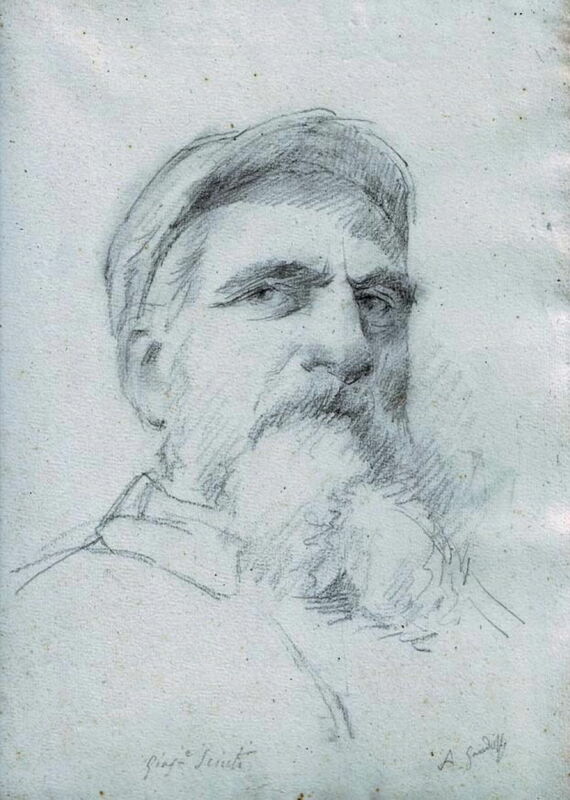 Antonino Gandolfo (1841–1910), Portrait Drawing of Giuseppe Sciuti (date not known), further details not known. Image by Luigi Gandolfo, via Wikimedia Commons. It’s not clear when Gandolfo made this Portrait Drawing of Giuseppe Sciuti, but the subject looks to be well into his fifties, if not older. Antonino Gandolfo died in Catania in 1910, something of a local celebrity. Naturalist painting was suppressed and forgotten during the twentieth century, but with the return of interest in Naturalism in the twenty-first century, it has been framed as a Northern European movement, centred on Paris and extending to Central Europe and the Nordic countries. I can nowhere find any reference to Naturalism in Italy, nor to these paintings by Antonino Gandolfo. Was he really the only Italian Naturalist painter? Posted in General, Life, Painting and tagged Bastien-Lepage, Capuana, Gandolfo, Macchiaioli, naturalism, painting, realism, Sciuti, Ussi, Zola. Bookmark the permalink.